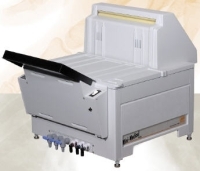 ‘Mini-Medical’…The most popular compact x-ray film processor in the world. The AFP Mini-Med delivers the highest quality x-ray images, week after week, year after year. Fully automatic and fully warrantied, you get the best of both worlds: outstanding film processing quality and years of trouble-free operation. Why has the AFP Mini-Med remained so popular over the years? The reason is simple: it’s simple. Simple… as in easy to use. Simply functional. Simply reliable. All those simples add up to another big ‘S’ word: Savings. The Mini-Medical has been designed with many of the time, space and money saving features usually found only in higher priced models. The simplicity of the AFP Mini-Med carries right through to the easy-to-understand operating manual that accompanies every unit. Should warranty repair be necessary, the Mini-Medical is backed by a comprehensive one year parts warranty and 2 years on the drive motor and recirculating pumps. Just contact a factory trained dealer service representative for prompt responsive service. Fast, Versatile... Loaded with FeaturesEasy Operation and Maintenance The AFP Mini-Medical/90 is a 90–second workhorse that pays for itself with smooth, steady efficiency in practically no time at all. Built and priced to make years of film developing cost effective, the Mini-Medical is the perfect choice for hospitals, private practices, clinics and mobile installations. Special versions of this processor are available for those dedicated to mammographic film processing. The Mini-Medical accepts all standard x-ray film sizes…from 4” x 4” (10 x 10cm) to as large as 14” x 36” (36 x 92cm)and can process 90 14” x 17” (36 x 43cm) films per hour. A visual ready indicator conveniently alerts operator after a minimal warm up period. After the last film is processed, the machine returns to an energy and water conserving standby mode. While in standby mode, a special ‘jog’ cycle is employed to guarantee consistent quality throughout the processing day. Separate indicator lights notify operator that solutions are kept at optimal levels and temperatures. An electronic sensing system replenishes solutions automatically, keeping all chemicals at peak operating efficiency. The AFP Mini-Med minimizes the consumption of water by eliminating flow during standby mode. Approximately 1/3 liter of fresh water is added during each jog cycle to reduce potential algae problems. Energy efficient I.R. heat lamps dry each film quickly and quietly. A unique pivot-back dryer rack enables easy access to wash section and for service and cleaning. The Mini-Medical drive system is the result of years of technological advances. Ultra-reliable and incredibly rugged, our new worm drive greatly reduces the load on the system and extends motor life. The AFP Mini-Med is CE approved, runs on standard 110V (220V optional) electrical supply and requires only a cold water line connection. It can be installed either inside or outside of the darkroom (when installing inside the darkroom with developed film exiting into daylight, a rear film exit version is required). The optional ‘no plumbing’ conversion kit can be used in conjunction with replenisher tanks to eliminate the need for running water and exterior drainage, ideal for mobile medical facilities. Fixer drainage hose fittings are compatible with most standard silver recovery units. The Mini-Medical also includes replenisher storage tanks, connecting plumbing hoses and a high strength, sturdy base stand. We’ve told you why the AFP Mini-Medical is the world’s most popular film processor (over 21,000 satisfied owners), but don’t take our word for it, make the Mini-Medical a part of your practice and see for yourself. Call Now! for special offers and pricing on AFP Mini-Med Film Processors.